Karl Casino will then reward you with a bonus (Welcome Bonus is for new players only). The terms and conditions of the bonuses vary between different casinos and might also change over time and between different countries, so it is important to compare the different offers and read the T&C for Karl Casino before signing up. 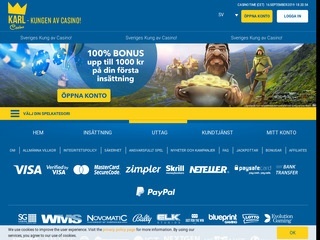 Karl Casino is a self-proclaimed King of Sweden’s online casinos, with the design and theme worthy of its royal aspirations. The site is clearly inspired by all things royal, from the beautiful shade of blue to the crown on top of the casino’s name. The first impression is of a very clean layout with only one drawback: the site is only available in Swedish language and if your Swedish is a bit rusty, the only other way to translate it, is to use google translate feature. Even with the language barrier, the casino platform is arranged in a way that makes it easy to navigate – should you decide not to change the language settings, you will still be able to find your way around the site. One glance is enough to figure out how to open an account and find the relevant gaming category – provided of course that you are not a resident of the restricted location (USA, France, Netherlands, Estonia…). Focused on the Swedish market and driven by the vision to provide a safe haven for their players, the casino owner and operator L&L Europe Ltd, met all the necessary legal requirements to obtain MGA and UK Gambling Commission licenses. In addition to that, the casino uses 256-bit encryption technology to protect the sensitive data of their users and provides games tested for fairness and randomness by independent agencies. The majority of games is placed under these two categories: Slots and Video Slots, although you can also find some variants under Jackpot. Unfortunately, the casino does not offer any options for a user to narrow down the search, or sort the slots according to the theme, payouts or return to the player percentage. In case you are not sure what you would like to play, the safest option is to check what are the most sought after slots or look for the releases with the badge “New” attached to the preview image. There are around 40 games under this category but even with plenty of variants, the selection is pretty traditional and not too versatile: Baccarat, Roulette, Blackjack, Poker and Red Dog. Video Poker has its own separate category with over a dozen variants, including Jacks or Better, Double Joker, Bonus Poker etc. If you are in a mood for something more kooky, Max Damage and the Alien Attack, Germinator, Bubble Bonanza and similar releases can be found under Other Games section. Almost all Live games are powered by Evolution Gaming and casino members can make their choice according to the table limits or the actual game – Roulette, Casino Hold’em, Baccarat and Blackjack. Once you are ready to place your first deposit, you can use Visa, MasterCard, Skrill, Neteller, PaysafeCard and Bank Transfer. The processing time is instant and no fees will be deducted. To withdraw the funds, members can use Visa, Skrill, Neteller and Bank Transfer – also fee free and with just one business days processing time. 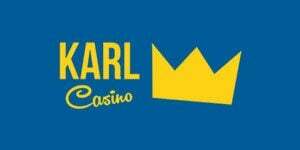 Withdrawals are capped at 50,000 SEK and the casino will start the verification procedure for all amounts over 15,000 kronor – which is the only currency that Karl Casino is accepting at the moment. To get in touch with the casino support, members can use email, Live Chat or call the customer service number. Unfortunately, the support is not available around the clock, so, if there are questions you need to be answered immediately, you may want to try the FAQ section. You will discover that pretty much all you need to know is already covered.